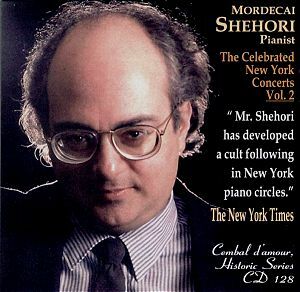 Recorded at Merkin Concert Hall in New York between 1984 and 1987 these are yet more documents illustrating Mordecai Shehori’s powerful, protean pianism. He approaches each piece as a musician not a cavalier and the results attest to his superior intellectual and digital control across a wide range of styles. He certainly lacks for nothing in panache or technique in Liszt or Kabalevsky but the programme also shows his acute concern for colour and texture in Rachmaninoff and for profundity of spirit in Beethoven. His Rachmaninoff Moments Musicaux are examples of his full blooded romantic credentials. The evocative sound world of the E flat minor registers through acute pedalling and control of dynamics; he shades things perceptively. The sense of ebb and flow in the music is captivatingly brought out - Shehori is faster than the composer in his 1940 Victor recording but he doesn’t sound rushed. Though Shehori moved in Horowitz’s orbit for a while his performance of the B minor sounds nothing like Horowitz’s; Shehori is much faster, gaunter, with a terse, unsentimentalised and pervasive gloom. Each of these pieces then is etched with a strong, pictorial character and Shehori does the honours in the case of the E minor. This was once spectacularly recorded by Moiseiwitsch; Shehori brings to it a palpable sense of controlled, coiled excitement. . Warm, mellow and consoling Shehori’s D flat major sounds, once more, entirely personal – Sofronitsky for instance sounds completely different in his responses. This is a first class exploration by Shehori. Talking of Horowitz and Moiseiwitsch they both recorded Kabalevsky’s Third Sonata. Once again, as one would expect of him, Shehori’s viewpoint is all his own, though closer perhaps to Horowitz. Shehori exhibits fearsome, trenchant control. He is duly winsome when Kabalevsky asks for it in the first movement but the power and struggle of the central movement is communicated with fierce assurance. He’s unusually expressive in this central panel and catches the giocoso martial cockiness of the finale – sweeping and commanding playing. His Liszt is similarly engaged; in fact it’s adrenalin filled to an appreciable degree and here the slightly clangourous recording can exaggerate those adamantine Shehori attacks. The CD recital actually opens with Beethoven’s Olympian Op.111. Shehori refuses to linger and meets all digital challenges with assurance. His playing brings with it a sense of unsentimentalised refinement as well as necessary rhythmic vivacity. It’s playing that doesn’t countenance the philosophic or stoic but it has nobility and grandeur. Once again then Shehori’s New York recitals show a musician of imagination, technique and control – playing of undogmatic insight in fact.